List of interesting topics where users publish, discuss and vote on them. 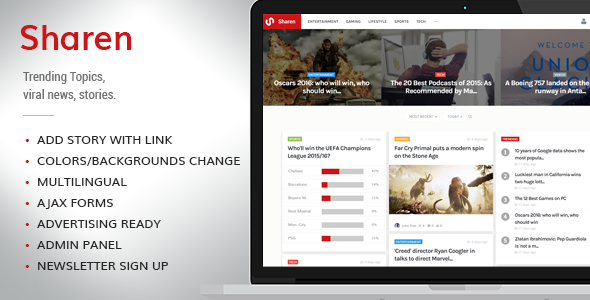 Sharen is responsive, php script, built for users want to share links, viral content, ask questions, etc. It's easy to get up and running and edit all options with a powerful admin panel. If you heard Hacker news website it's something like that. Choose above to see the layout. - User registration for publish. - Post Option (Voting, Comments). - Custom Post (Text, External Link, Question). - Gravatar user profile image detection. - Custom colors + Google Fonts. After login in Front end, use the url. On update: Please read the text file update on root downloaded file. - user profile url "u/user"
You can see all change logs in .txt file on root of download file. Invoicetime - Getting paid on time. Keywords: ajax, codeigniter, content, gravatar, newsletter, questions, rating, responsive, share links, Share News, stories, trending, viral.